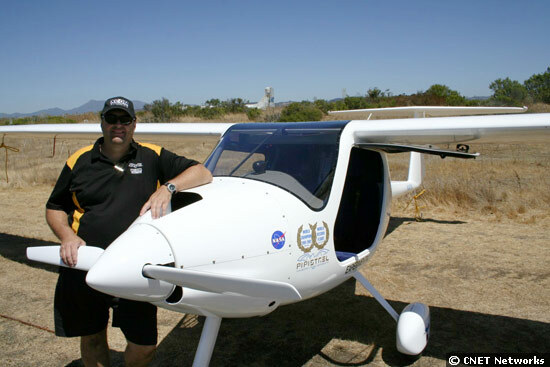 Michael Coates alongside the winning Pipistrel Virus Aircraft. It’s been just over a month since we completed the CAFE/NASA PAV challenge and the worldwide exposure to the abilities and economy / performance of the Pipistrel aircraft has been unbelievable. Interviews have been broadcast by television, radio and Internet with world wide TV coverage from CNN and the BBC. Funded by NASA’s Centennial Challenges and the Boeing Phantom Works the event is run by a private and independent group in the USA. Probably the first and most popular question I get asked is what is the CAFE PAV challenge ? CAFE stands for Comparative Aircraft Flight Efficiency and the PAV stands for Personal Air Vehicle. The CAFE Challenge is a series of events or competitions held over a one-week period at the beautiful Sonoma County airport in Northern California. Aircraft compete in a range of events which are designed to bring out and showcase the best that each aircraft has to offer. The main goal with this competition is to find the most suitable aircraft which is extremely fuel-efficient, high touring speed, short field landing and takeoff ability and very importantly low community noise levels. The aircraft ready to taxi out with the wing probes fitted. 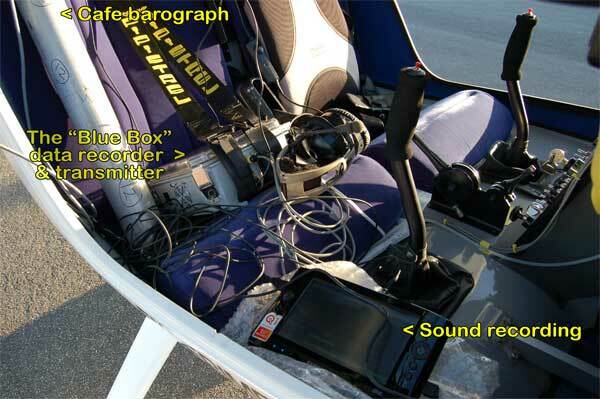 The probes send information wirelessly to the “Blue Box” which then sends the information down to a ground station data recorder for real time information. 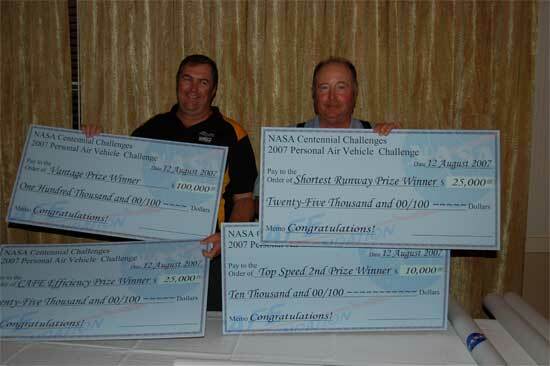 The idea being that the type of aircraft winning the cafe challenge may be the type of aircraft which in some year’s time replaces the motor car for regular private transport and can be operated out of a series of smaller airports in the suburbs rather than larger commercial locations.As the major sponsor it is NASA’s vision to have less centralized system of air travel which can be operated by somebody with the same skills as required to drive a car in nearly all weather conditions. NASA predicts in the future that up to 45% of all miles traveled in the USA will be by PAVs relieving congestion at the Metropolitan hub airports and saving more than 6.8 billion gallons of fuel which are wasted each year in traffic gridlock. Forget visions of the Jettisons’ and Star Trek, we are still well away from that scenario at the moment. In the next 5 years of the competition I expect most of the entrants will be conventional aircraft like this years competitors with modifications to improve the efficiency, performance and noise. As the prize money increases each year from now and interest has been sparked from other inventors I imagine we will see a large range of differing aircraft all with some unique features which may one day be integrated into the ‘car of the sky’ concept. 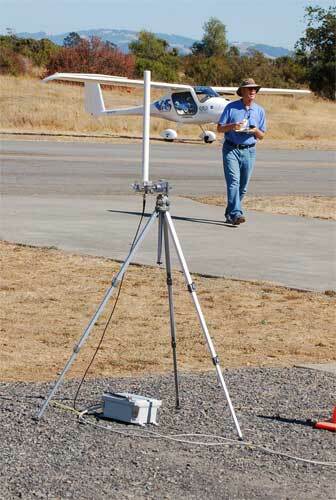 LEFT: Ground based telemetry station receives the information from the competition aircraft and transfers the information directly to a computer. To stimulate rapid innovation in PAVs NASA has funded the cafe challenge to the tune of $2 million US dollars in cash prizes over the next five years, in this way for a very small investment NASA can get the private sector to come up with all the ideas which may have cost NASA 100 times this amount to come up with the same result. As a winner in this year’s competition I can say it is money well spent!, but I fully expect next year’s event will be much more competitive with the number of onlookers visiting this year just to check out the competition. 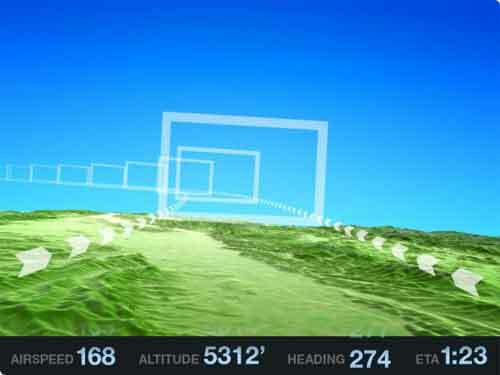 Nasa’s vision of the “highway in the sky” concept enhanced by synthetic vision. The CAFE event itself was a series of sometimes challenging tasks to determine which aircraft came the closest to the ideal vision of a personal air vehicle. Some of the easier tasks were short field takeoff ability, community noise on takeoff, community noise on over flight, cabin noise at maximum straight and level speed and then one of the harder tasks was a 400 mile navigation exercise which included over 20,000 feet of climbs and 20,000 feet of descents whilst maintaining an average speed over 150 miles an hour and keeping the fuel consumption is low as possible. One of the really interesting outcomes of this cross-country event for me was the fact that I lost over two pounds in body moisture whilst competing! Everything is weighed to the ounce including fuel, the weight of the aircraft and the weight of the pilot including all the safety equipment maps etc. It really surprised me that just through sweat and moisture lost through breathing that I lost over two pounds in just under 3 hours, Amazing! And it probably confirms why after a six or seven hour flight if you haven’t drunk a lot of water you are very dehydrated. The actual performance figures for the winning aircraft this year follow…. # The mpg figures where calculated on the 400 mile race and are much higher than our normal cruise consumption because of the 22,000 feet of climbs and also the need to maintain a minimum speed of 150 mph meant pushing the aircraft fairly hard. owner and dealer for California Vance Turner on the right. The really good thing about these performance figures is that they are third-party independent figures using the very latest in aircraft recording devices. There is no way for the aircraft manufacturer to fudge or exaggerate any of these figures because all of the recording and weighing is done in a completely sterile environment under the supervision of not only NASA but also the events organizers. Next year’s event will be much harder because of increased competition and improvements planned by several of the competitors, be assured however we will continue to do our best to improve the Pipistrel to maintain our leading edge performance. Finally, the aircraft we flew in the event were completely stock standard Pipistrel aircraft without any modifications (with the exception of a few feet of duct tape and our secret weapon…. Slovenian Speed Spray!) It really confirms that the Pipistrel aircraft are world leaders in performance and efficiency.